A rematch, with a revised version of the Heavy Mechanised Imperial Guard list that took my Eldar apart in one turn last week (see here). Andrew and I had made some suggestions for increased points/decreased power to better balance it compared to approved tournament lists, and these suggestions had been taken on board by the Army Champion and we gave it another run. 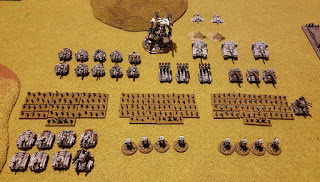 I decided to take another Imperial Guard list (Steel Legion), figuring that would be a good test. I chose a pretty standard competition style list (e.g. 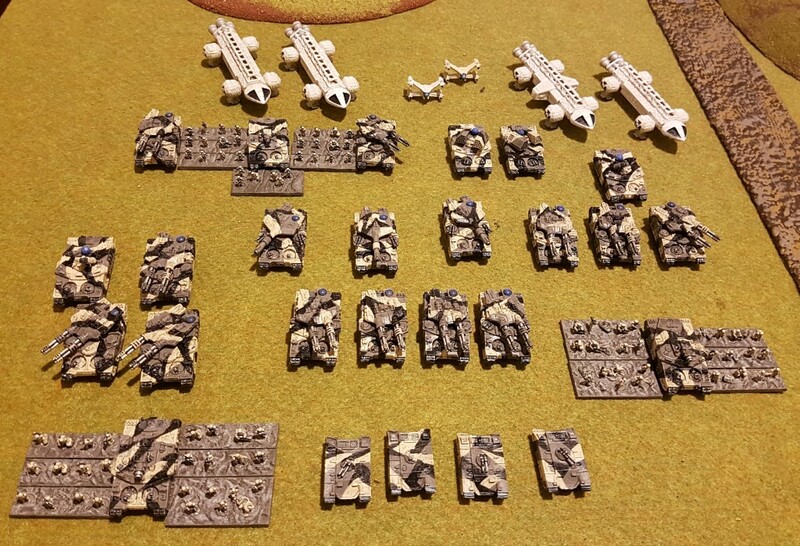 if you look at the more successful Epic UK Tournament lists here), with Infantry Companies and Shadowswords forming a core, plus some scouts, thunderbolts, and then some extras. 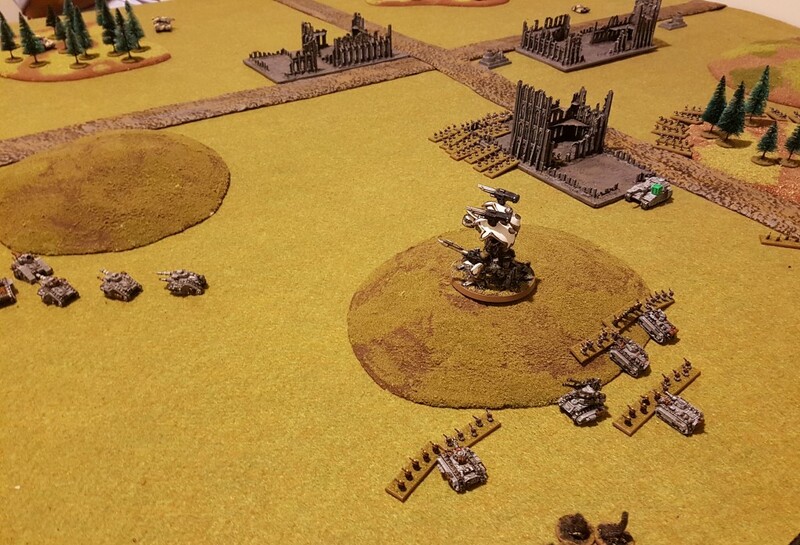 The Warlord Titan, and Leman Russ Company are more rarely used, given how many points they take up at 3K points. But given it was a 4K rather than 3K game I thought it would be worth trying them. At 3K two Warhounds are a very commmon choice rather than a Warlord, though I see a Warlord has even been used a few times without complete disaster even at 3K which is encouraging. It's a lot of points in one activation, but it does have some serious firepower and resilience. 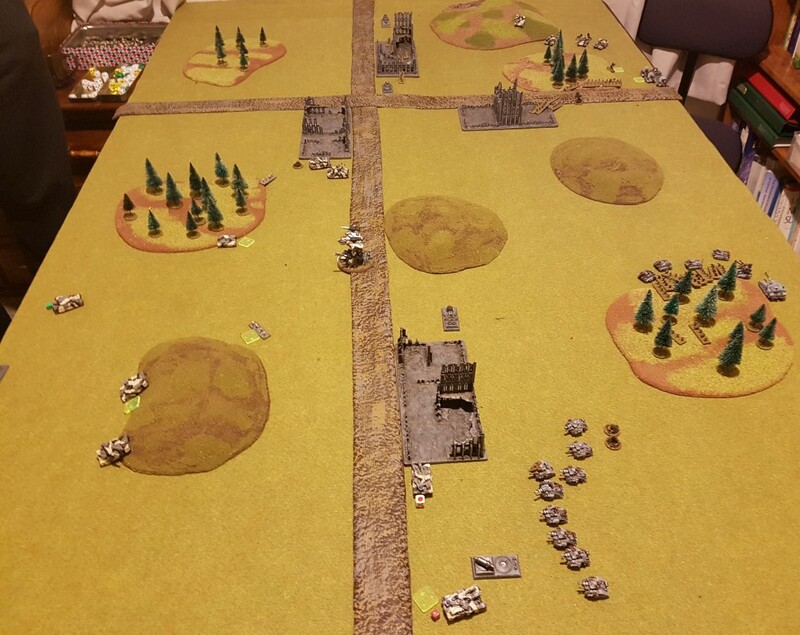 Andrew used the Heavy Mechanised Imperial Guard list again, which has been reformulated after our feedback as described above. (The various aircraft in the army photo are standing in for Thunderbolts). Here's the setup. 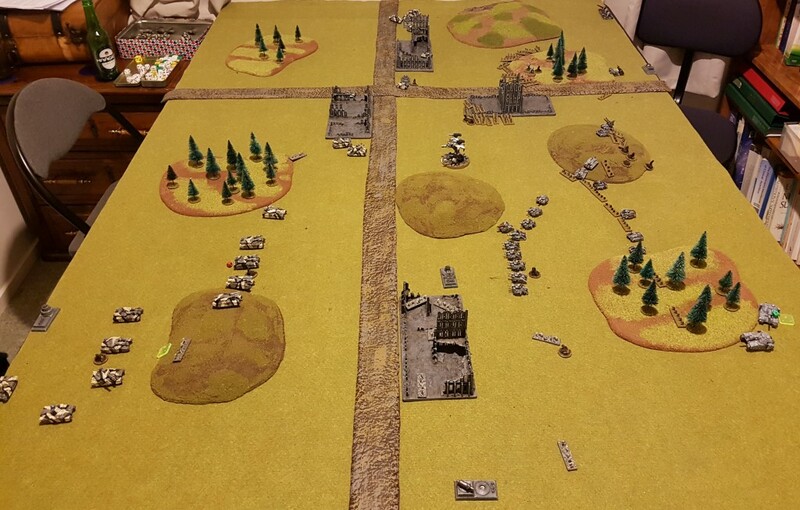 Steel Legion (SL from now on) Blitz objective is near the road bottom right, and Heavy Mechanised Imperial Guard (HMIG from now on) Blitz obejctive is top left. 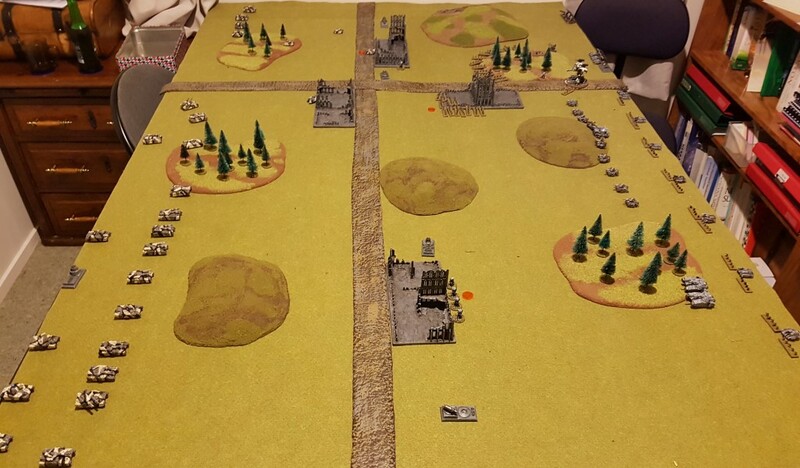 Take and Hold Objectives are in the middle of the table, SL on the left, HMIG on the right. I deploy my Warlord on the road so it can advance quickly to a useful position. Tank Company is central to try and soak up fire and dish it out. Shadowswords back ready to target the enemy Shadowswords primarily, but also (on my left) I deploy two of my Shadowswords to try and deal with the Assault Launchers which are exposed as targets (top left). 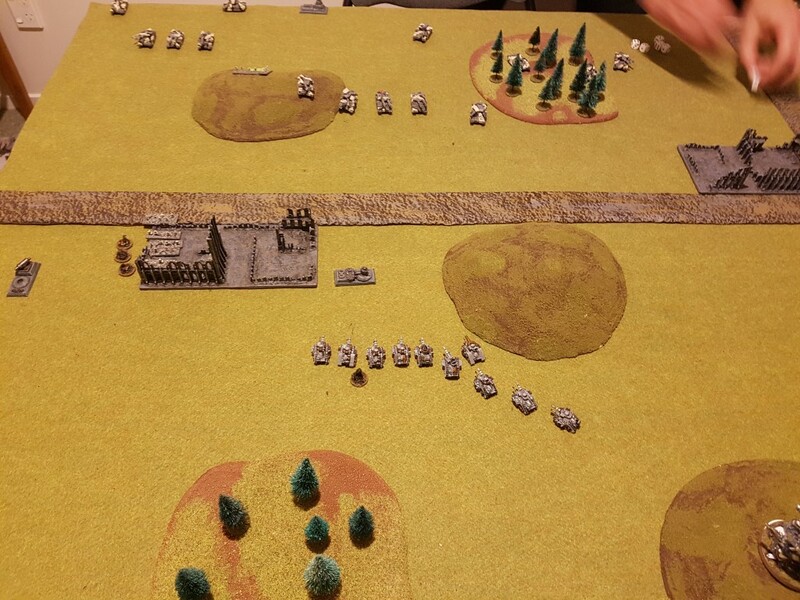 My infantry hugs the ruins and forest to my right, garrisoning, and my Regimental HQ is deployed spread out at the back to avoid artillery. Sentinels garrison forward. HMIG has a line of armour, slightly more concentrated on his right than left, but not by much. HMIG Shadowswords are more central. HMIG wins Strategy Roll. 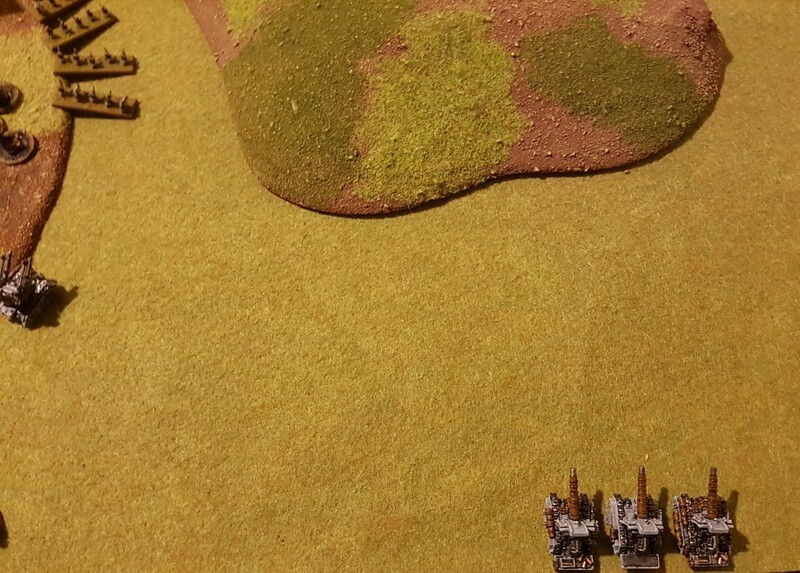 Assault Launchers attempt to rain destruction on my own artillery and infantry, but the to hit rolls are terrible! 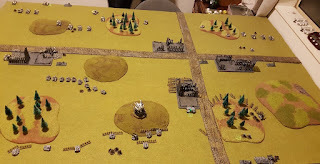 The Manticores survive and the only casualty is the unlucky Commmander of an infantry company and the Commissar he was talking too. Nonetheless the suppression will limit the Manticores effectiveness this turn at least. HMIG follows up with a Shadowsword targetting one of my own Shadowswords, but it also misses! 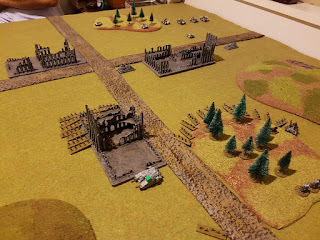 My Shadowsword fires back and does two damage to the enemy Shadowsword, and then my Basilisks finish it off while it is broken. Killing the Shadowswords is a priority in this game! HMIG Macharius Heavy Tanks and SL Leman Russ tanks advance on each other and fire but the shots bounce off the hulls as they close, bar one damage to a Macharius. Thunderbolts wreck my Sentinel Scout screen, and kill a couple of infantry from my Regt. HQ. My own Thunderbolts refuse to activate this turn. 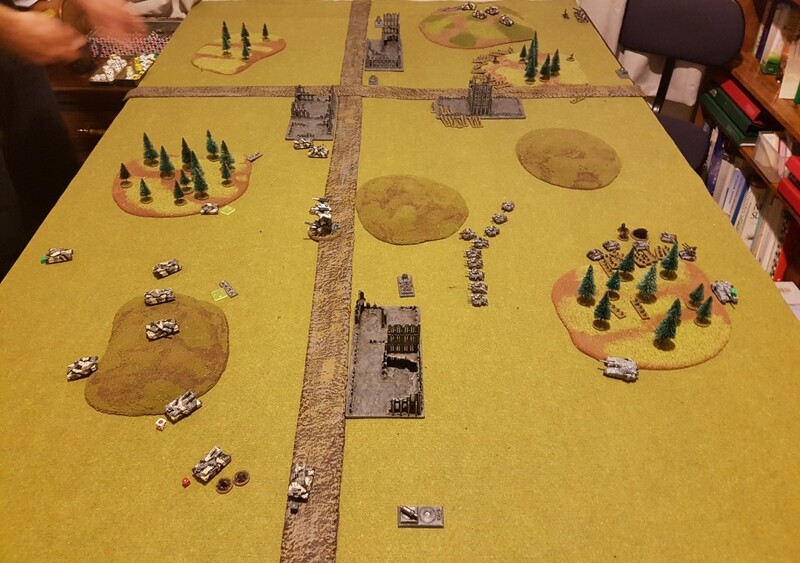 Both HMIG Stormtrooper Platoons advance to the ruins (bottom centre of photo below). 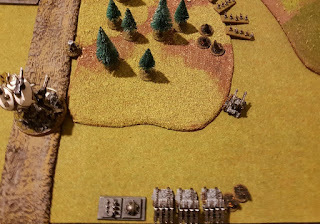 In a rather stupid move with the Warlord, I double to my left and fire upon them, doing no damage... should have just moved down the road to be set up for next turn instead. HMIG suffers from failures to activate with two tank companies, and these just advance. Situation after rallies... end of Turn 1. I win Strategy Roll this time. 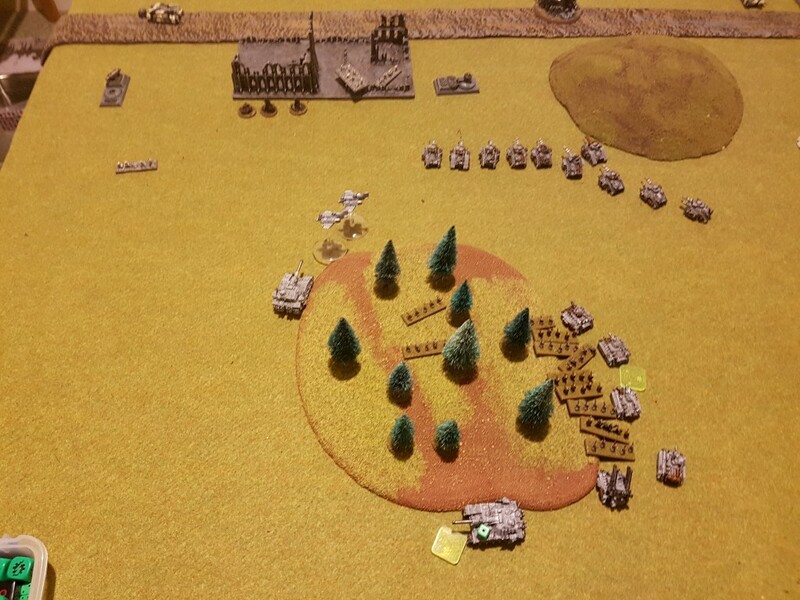 My Leman Russ sustain fire on the Stormtroopers in front of them, killing 4 infantry and the Crassus transport and breaking them. I retain and a Shadowsword destroys the Crassus from the other Stormtrooper platoon. 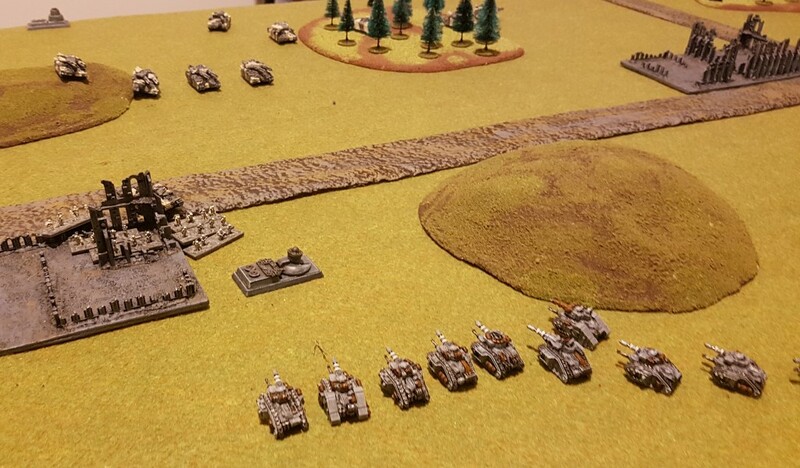 HMIG tanks line up my Leman Russ, but fail to kill one! And disastrously the Crassus transport blows up killing 5 of its passengers...! The Macharius tanks kill one of my infantry. 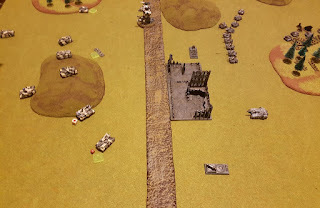 I double forward with my Warlord and destroy a another Shadowsword. I'm out of position with it thanks to my first move and miles away from any objectives. I kind of hope that HMIG will target it rather than my other formations, but they aren't stupid and ignore it. 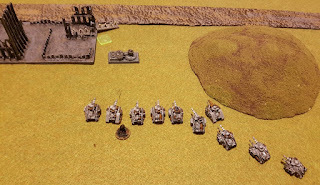 Macharius tanks push forward on my right, and I have little to oppose them here. 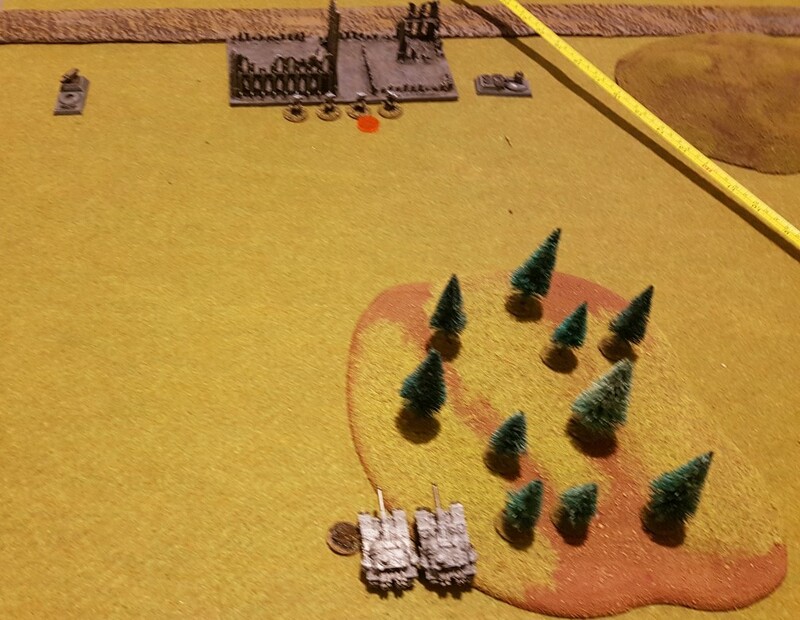 Their long range fire finds a gap and manages to blow up my central Shadowsword. One of my Shadowswords on my left breaks and falls back after it is hit by another HMIG Shawdowsword. 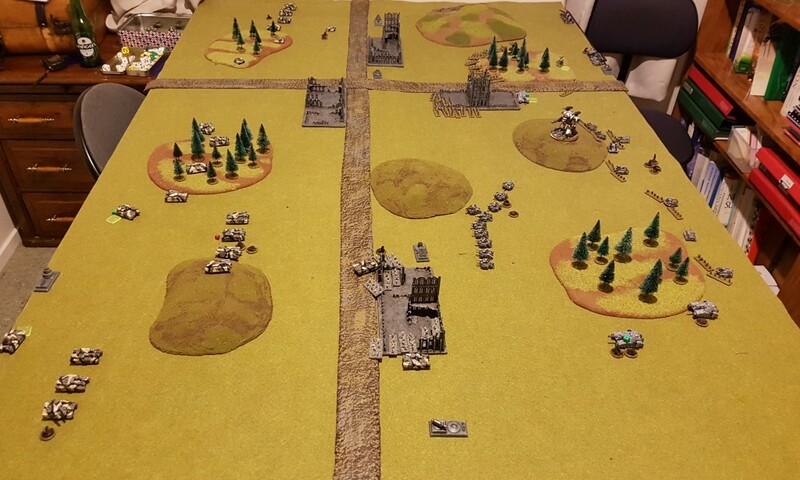 HMIG Thunderbolts kill a Hydra and two Manticores, and my own Thunderbolts shoot down two of the HMIG Thunderbolts. HMIG win Strategy Roll. 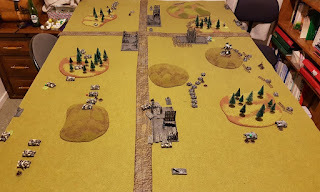 The remaining Assault Launcher is back in action and it blasts Sentinels and infantry, killing one sentinel and breaking them, and one infantry. 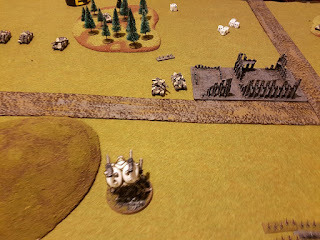 A HMIG Shadowsword fires and misses. 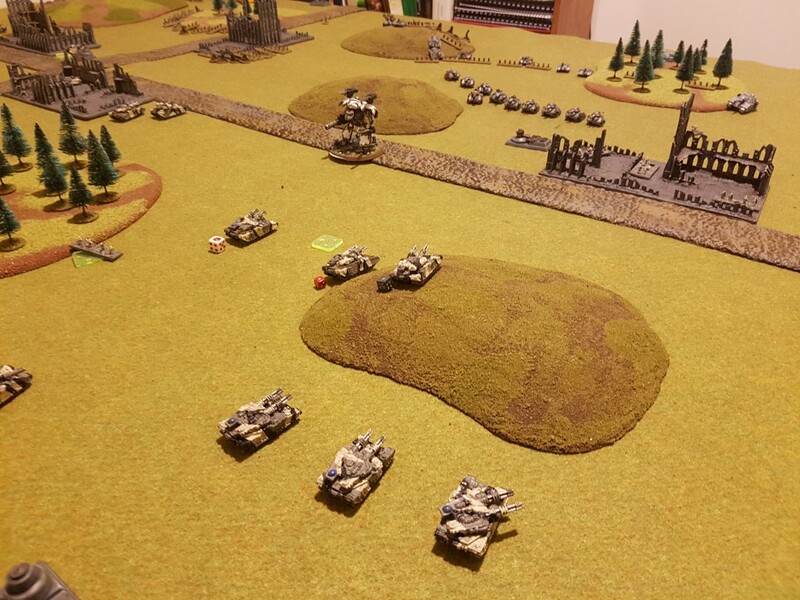 I eventually manage to break the Salamander Scouts which are holding back any infantry advance from me (and proving surprisingly difficult to eliminate!). My own Shadowsword shoots and breaks anotherHMIG Shadowsword. My Warlord also doubles yet again, and this time manages to wreck a tank company, and get into range of an objective finally. 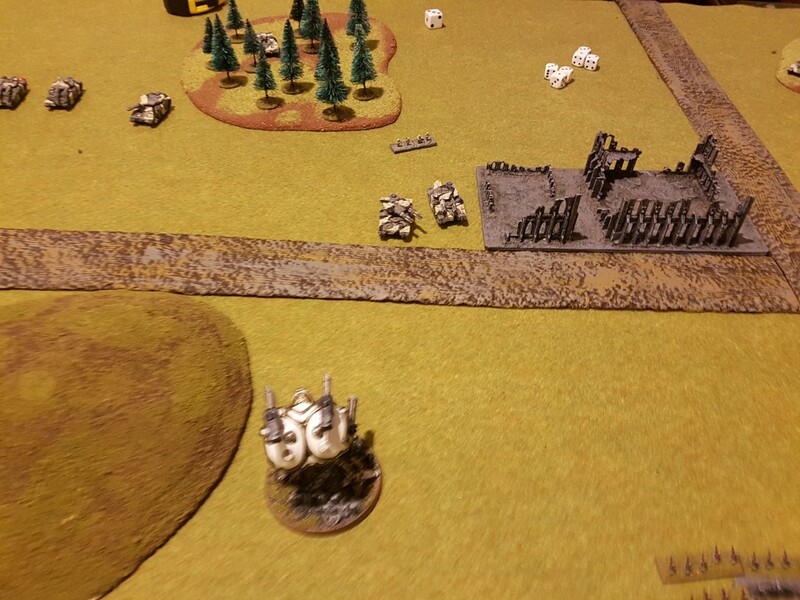 HMIG tanks advance on my right and shoot my Basilisks but fail to damage them! Thunderbolts also fail to break them as I keep making 5+ armour saves without fail! Thunderbolts do destroy my remaining Manticore though. On my left flank I try an engage action with my Regt HQ against the Stormtrooper Platoon in the ruins on my left, supported by the four of the Leman Russ. 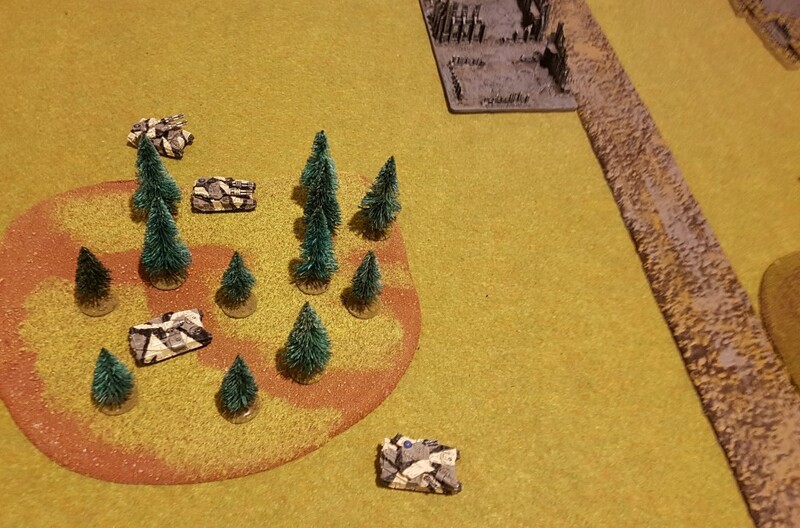 It goes badly though, I lose 4 Chimeras and retreat back to the woods, having killed only one Stormtrooper. 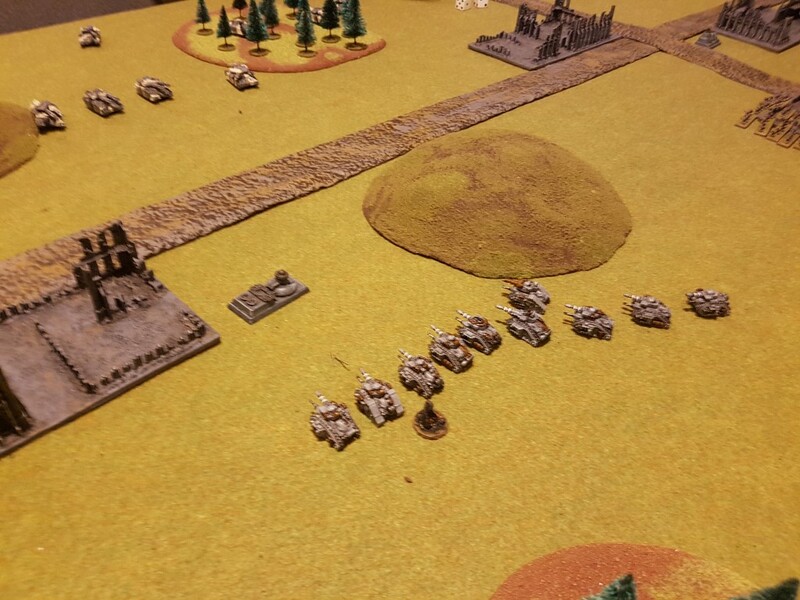 End of turn 3 and Macharius Tanks are almost at my Blitz objective, but the HMIG right flank is looking shakier. I win Strategy Roll this time. 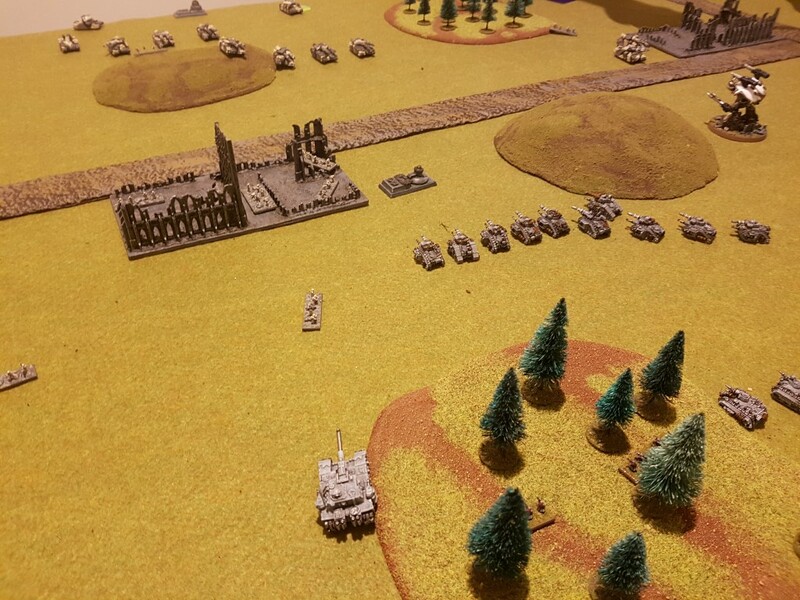 My Shadowsword shoots and kills the Macharius tank in front of it breaking the formation. 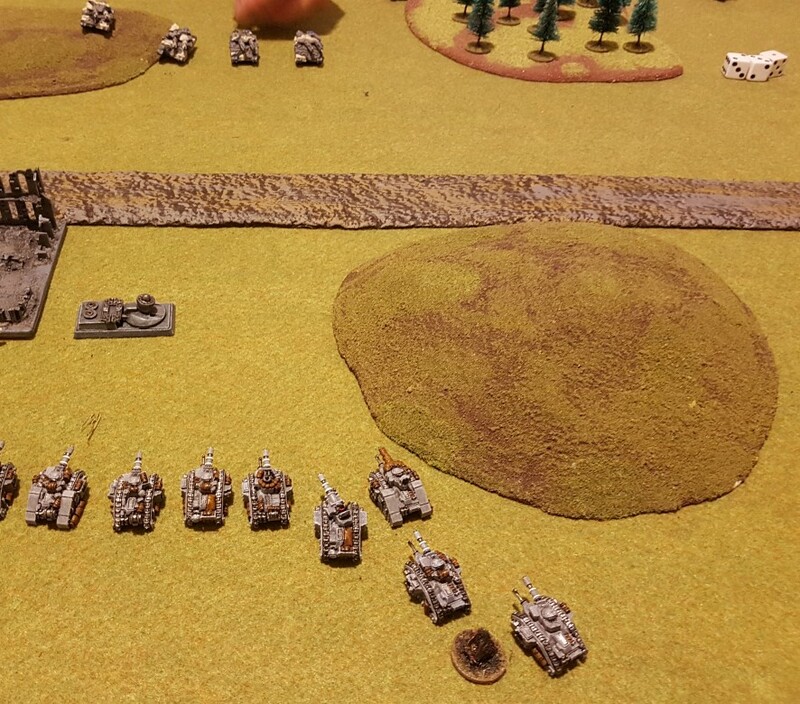 I retain with the Warlord which sustain fires and wrecks another Macharius Tank company. 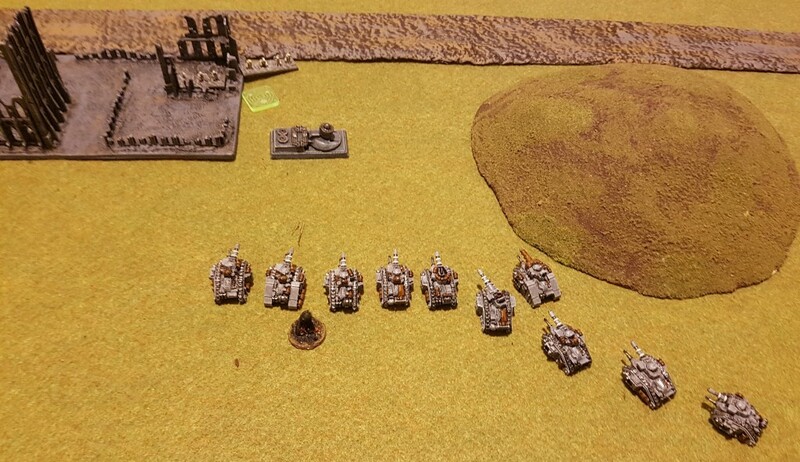 The Macharius Tank company on my right engages in a firefight, cunningly bringing my Basilisks and a Sentinel into support range so that if I lose the firefight they will also break. 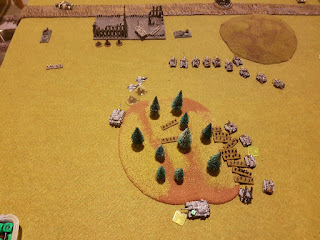 This is what happens, I lose the firefight, 5 infantry from the infantry company, and the Sentinel and Basilisks also break for being in support range of a losing combat (as they are both one blast marker off breaking). 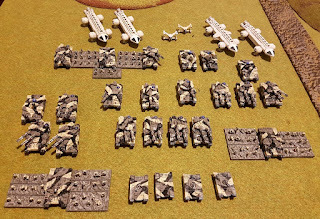 The Macharius consolidate into range of my Blitz objective to hold it. The two Macharius Tanks in the centre fail their activation roll, and despairingly resign themselves to loosing some long range shots at a Shadowsword - but they hit and blow it up! I retreat an infantry company back towards my Blitz to contest it. 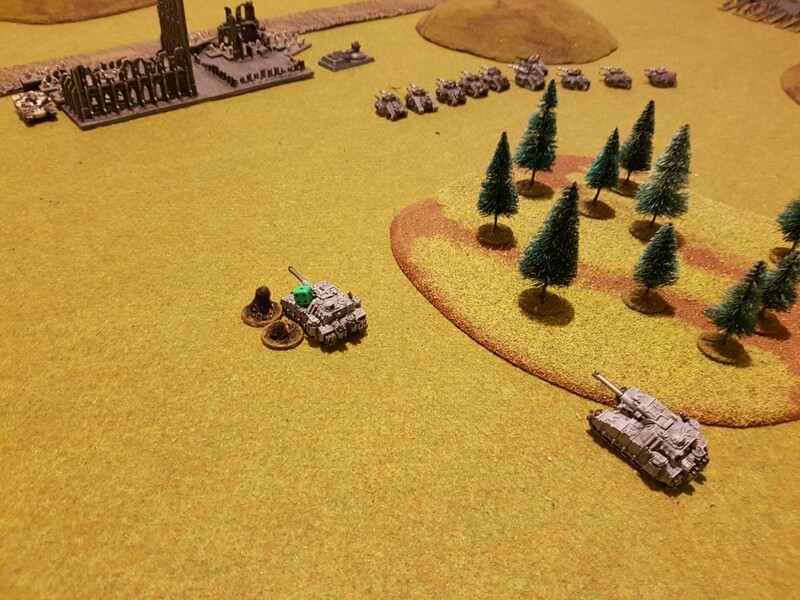 Another Shadowsword of mine freshly rallied tries a long range shot and inflicts a point of damage on the Macharius Tank contesting my Blitz. 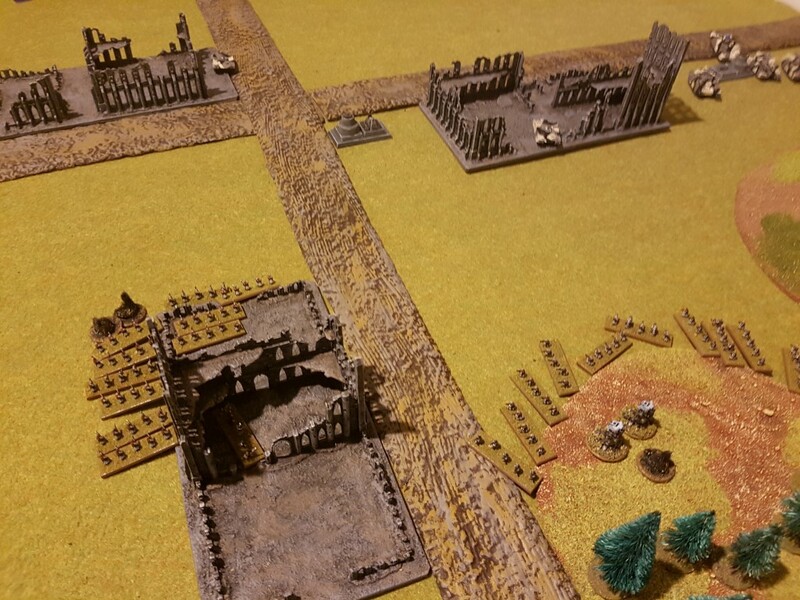 Both armies are pretty exhausted, and failing activation rolls. The HMIG launcher marches to try and contest it's Take and Hold Objectives (seeing as it can't fire this turn due to slow fire ability), but my Leman Russ double over and destroy it. We are both out of activations. End of turn I have Take and Hold, but no other Victory Conditions have been achieved by either side. The game fails to go another turn and we count victory points. SL have lost 1250, and HMIG 2500, so victory to SL! 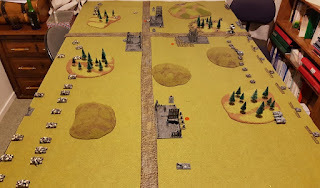 So SL won out in the end - though it was a close run thing with neither side able to achieve a really decisive tactical dominance on the table. 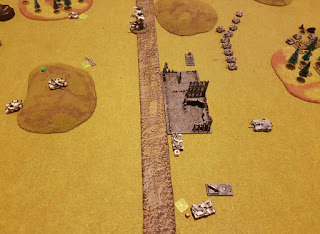 SL was also saved on several occasions by terrible shooting rolls by the HMIG, and some repeated activation failures with Macharius Tank formations. 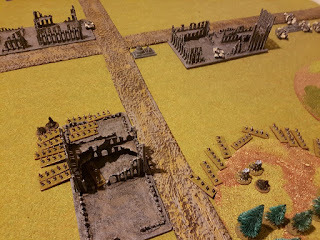 And, as I put up the army list for this report, I realised I was also cheating by having an extra 50 points (1.25% extra)! 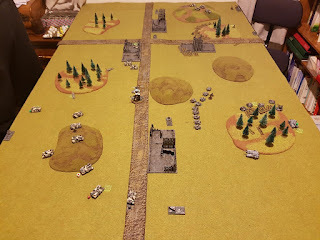 This came about when at the last minute I took out a Shadowsword for another artillery battery in order to avoid having a list too tuned vs the HMIG, but I forgot to lose another 50 points - oops! Sorry Andrew! As to the game itself, I immediately wrecked my plan with the Warlord Titan in turn one by sacrificing tactical position to take some wasted shots at a low priority target. It did have a certain useful area denial effect despite this. But, if you're using a Warlord Titan you really need to make sure you are thinking ahead much better than I was. Luckily it still managed to get to a position to wreck things for two turns, despite 3 turns spent foolishly doubling this way and that. 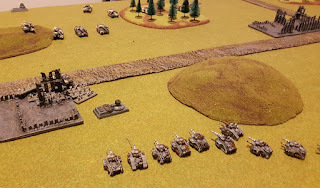 My Leman Russ also performed very well, having greater luck in exchanges than the Macharius, shrugging off all damage bar a Shadowsword hit and handing out a lot of punishment in return. 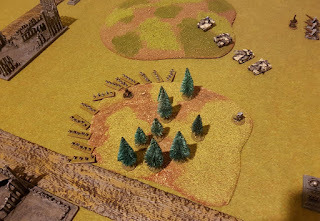 The Macharius firefight assault at the end of the game breaking 3 formations, was one highlight for them, the Crassus explosion during movement ion the forest a "lowlight". Having had that experience with Ork battlefortresses a few times, I know the pain. 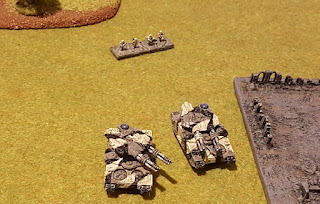 The HMIG Thunderbolts were also able to inflict a fair amount of damage on lightly armoured formations in the SL force. Facing a SL list like this is likely also one of the tougher potential matchups for the HMIG given I had 4 Volcano Cannons in my list. 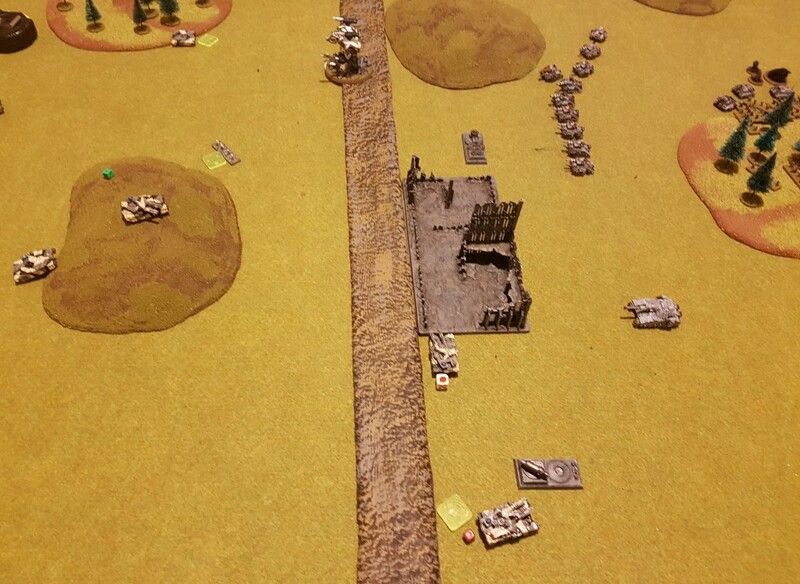 I managed to destroy one of the Assault Launchers turn one with a Shadowsword, which was comforting. 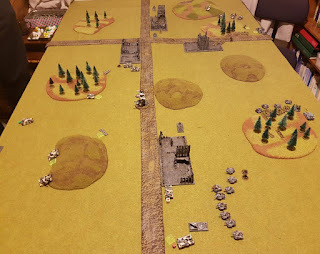 This was partly because the HMIG side of the table had fewer obvious places to hide artillery than my side of the table, especially with my Warlord Titan looking like it would power on down the road. Many other armies will no doubt struggle much more against all the heavy armour, so it is bit of a matchup specific army, like a Titan force in some ways. Anyway, the most important point is that the HMIG list also appears to have taken a much greater leap towards being balanced than the original version. I'd say finessing rather than complete overhauling is now required to balance it vs already approved competition lists.